H.Crabtree Ltd. is a long-standing shareholder member of the Pallet-Track national freight and logistics network. 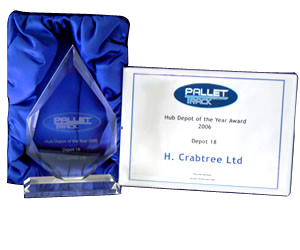 H. Crabtree Ltd. was delighted to be named Pallet-Track Depot of the Year. This prestigious award is evidence of H. Crabtree’s ability to meet customer’s stringent performance and documentation requirements. This is due to our staff's expertise in delivering next day, economy, and timed deliveries and collections as required. Pallet-Track is made up of 60+ transport operators and in co-operation with these operators H.Crabtree can deliver to every corner of the United Kingdom. Pallet-Track members are rigorously monitored for their level of commitment, professionalism and efficiency, and this has helped bring a new level of excellence to the overnight pallet industry. Since joining Pallet-Track in 2004 H.Crabtree has invested in people, facility and operational machinery. These investments have led to improvements in service quality. H.Crabtree's customers can always expect professional service, timely deliveries and excellent value for money. H. Crabtree is delighted to quote for one off or more regular palletised deliveries throughout the UK. Simply fill out the online pallet shipping quotation form for a fast response.